We would like you to #sayhello to our Utility Attendant Jose. 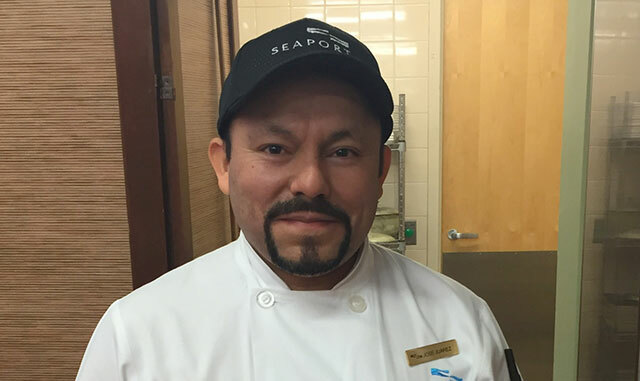 A nine-year Seaport veteran, Jose spends a good deal of time in our interactive Action Kitchen, often stepping outside of his role to assist guests with their recipes. When he’s done, he handles clean-up like the professional that he is – the kitchen is pristine and ready for our next guests. Jose says he thrives on the guest interaction, and enjoys every day on the job. In getting to know Jose over the years, we have come to learn just how dedicated he is to Seaport - his commute is unlike any other! He often takes two trains and a bus to get to and from or else he hops on his bike or skateboard (when Mother Nature allows!) Family keeps him busy when he’s not working: his daughter is 11 and together they enjoy spending time in their garden. We are honored that Jose is a nominee for a Massachusetts Restaurant Association Stars of the Industry award, and wish him the best of luck tonight at the awards ceremony!